WASHINGTON (AP) — President Donald Trump met Friday with President Sebastian Pinera of Chile at the White House for talks that focused on trade, security and the humanitarian crisis in Venezuela. Trump welcomed Pinera to the Oval Office days after he imposed financial sanctions on members of Venezuelan President Nicolas Maduro’s inner circle and suggested Maduro could be ousted in a military coup as a way to restore the country’s democracy. Tens of thousands of Venezuelan migrants are in Chile. “Venezuela is a mess and it’s got to be cleaned up and people have to be taken care of,” Trump said in response to a question from a reporter. It was Pinera’s first visit to the White House since he returned to Chile’s presidency last spring. Chile has been watching Trump’s trade fight with China, which is Chile’s largest trading partner. Chile is the world’s largest exporter of copper and its central bank has raised concerns about the U.S.-China trade and a decline in copper prices. The White House said after the meeting that the two leaders discussed security issues, freedom and democracy in the Americas and “fair and reciprocal” trade between the two nations. Their consultations took place ahead of Trump’s first trip to Latin America in late November, when he’s scheduled to attend the G20 summit in Argentina and also visit Colombia. In front of the cameras, however, it was all pleasantries for two billionaires who were entrepreneurs before entering politics in their respective countries. 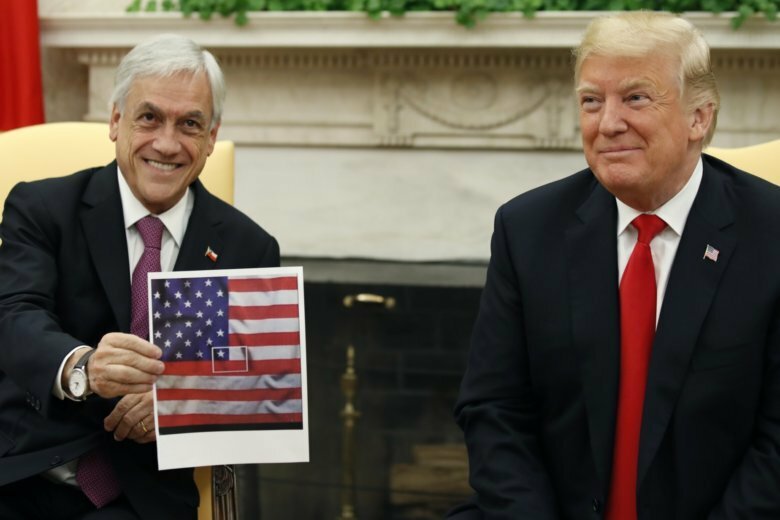 In a show of solidarity with his American counterpart, Pinera displayed for Trump a printout of a red-white-and-blue American flag that contained the outline of a small Chilean flag. “This is the American flag, and there is the Chilean flag, right at the very heart of the U.S. flag,” Pinera said holding the print-out, bringing a smile to Trump’s face.